From magazine and alt-weekly cover stories to shorter pieces, here are most of the feature articles I've written over the years. Can We Turn Back the Rising Tide of Incompetence? You know who they are. And if you don’t know, be assured that everyone else does. They’re the incompetents. And they’re everyone’s greatest frustration: This department would run so well if it weren’t for that guy. In almost any division, department, office, there’s a weak link—someone who has to be worked around, someone everyone knows never to involve in key projects, someone who makes everyone’s life a little more difficult, someone who holds back the rest of the group. They began lining up an hour and a half early, coming directly from Rush Limbaugh's appearance at Filco Discount Center to Chico State's Laxson Auditorium, waiting in lawn chairs for the talk-show host's Friday evening appearance. In case anyone was unclear about the audience's political slant, promoters distributed "Rich Republican" buttons to the first people in line. Will We All Be Unemployed? When we hear about manufacturing jobs moving overseas— whether in steel, cotton, textiles, or Buicks—it doesn’t sting all that much anymore, unless, of course, a family member is among the pink-slipped unlucky. Somehow it seems inevitable—progress, even: The United States is continuing its forward movement, leaving behind the remnants of the Industrial Age and bringing its diverse workforce into the Information Age, ready to lead the way. It was a warm summer night and we walked into the bar and started looking for the men we were supposed to meet and one of them saw us and walked over. "Matthew?" he said. "Mark Bailey." He looked a little tight already even though no one had started drinking yet and we followed him to a table where his partner sat and the partner stood up and put out his hand. "Eddie Hemingway," he said. It's become palpable enough to taste. Gunfire rings out in the night; local TV news programs lead with what bleeds. Polls proclaim that a majority of Californians feel something must be done about the "immigrant problem." Politicians, unwilling to embrace progressive economic policies, decry affirmative action and welfare programs and promise to build more prisons. Like rats deserting a sinking ship, we crawl over the top of each other in order to survive. Call it fear. Call it hate. Call it rage. Does It Really Pay to Pay for Performance? You're a CEO, with a $1 million base salary and stock-option incentives worth up to $4 million. You work as hard, as smart, as you can. You steer the company deftly through complex markets. You function at the peak of your abilities. You provide the firmest leadership you can. OK. Start over. You're the same CEO, with the same $1 million salary—but now your incentives top out at only $2 million. Now how hard, how smart, do you work? How firm is your leadership? Where do you steer the company? And if you insist that your performance would be no different, why should the company dangle that extra $2 million? Teamwork. Perseverance. Effort. Imagination. Aspirations. Inspired yet? How about when these one-word slogans are placed below photos of sunsets and sailboats and joggers and the Statue of Liberty, set in black frames, and hung along company corridors? Is There Merit in Merit Pay? Your managers hate it. Your employees hate it. By any measure, it doesn't do what it's supposed to do. In fact, no one's quite sure what it's supposed to do. It's the annual performance-review charade, in which, typically, managers and managed play an uncomfortable, closed-door game that no one wins. The end of the game comes with the announcement of a number. The number may be 3, 4, 5, or even 6. The heat is scorching, and a limp American flag—with an American Indian superimposed—overlooks the remains of a campfire and the table where Caleen Sisk sits in a battered metal chair, holding a walking stick. She speaks firmly. 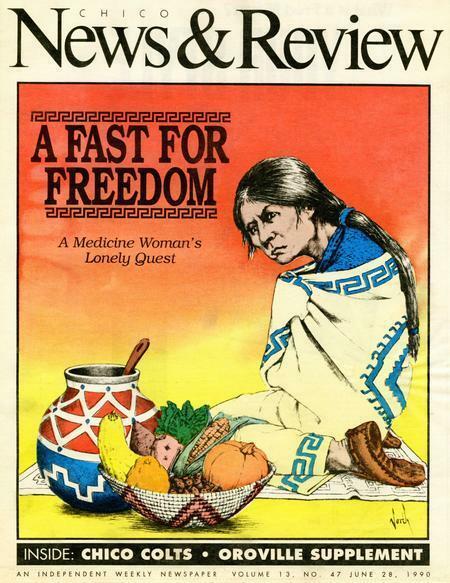 It is her fourth day of fasting—of surviving on water and an occasional Indian mix of water and acorn meal. Despite the heat and the hunger, she shows little signs of fatigue or the kind of disorientation that comes with forced hunger. Her fast comes not from a personal decision, but from a collective spiritual obligation. To say Park Avenue merchants are fed up with the Jesus Center "derelicts" would be something of an understatement. "They're obnoxious, they're drunk, they never have enough money, they try to steal cigarettes and wine," says Bill Siver, a clerk at Duke's Cork 'n Bottle. "I'd rather not deal with them." Translation of the September 2006 TCB Review cover story "Can We Turn Back the Rising Tide of Incompetence?" Counting the Costs: How Corporate America loses $4,097,400,000,000 every year. Sort of. You have to wonder how corporations make any money at all. Not only do they struggle to cope with globalization, labor shortages, and a lagging economy—they lose unfathomable sums to every thing from illness to fraud to computer problems to employee anxiety. Just check out the list of figures at right—figures that purport to catalog the billions of dollars that these maladies "cost" U.S. corporations every year. The Persistence of Perks: Lean and mean doesn't apply to executive perquisites, but they are changing—if quietly and slowly. What should be first to go when a company begins cost-cutting? The obvious items, many might say, are executive perquisites, those seemingly extraneous benefits intended to bestow status by separating the captain from his troops: company car, company-paid spouse travel, reserved parking, company-paid legal counseling and country-club memberships, executive vacation plans. These days the world of big business seems a less and less pleasant place in which to stay. News of plant closings and permanent layoffs peppers the evening broadcasts; corporate boards' demands for immediate results have left many CEOs tentatively occupying offices as volatile and bloody as any metropolitan mayor's. Real Office Politics: Between corporate interests and employee preferences, it can be a real horserace. In 1802, Thomas Jefferson proposed a “wall of separation between church and state,” and the United States has had one ever since. The nation has never had such a wall separating politics and business. It wasn’t some Gilded Age tycoon who said, “The business of America is business”—it was President Calvin Coolidge. Republicans and Democrats vie to be corporate America’s favorite party. Candidates and officeholders deliver speeches on factory floors, stage photo ops with prominent entrepreneurs, and play golf with top CEOs. Another Chico State semester—another series of forums, displays and speeches dealing with the continuing crisis in Israel. And again the university's Jewish students are in an awkward, uncomfortable position. The Honesty Business: Paper-and-pencil honesty testing has gained a foothold in hiring policies, but complaints and concerns linger. When Congress banned polygraph testing for hiring purposes five years ago, pencil-and-paper integrity testing appeared ready to take its place. Written tests, proponents said, were simpler and quicker, less intrusive, and much less expensive—the perfect, painless antidote to the losses American companies suffer annually in pilfered cash and merchandise—up to $50 billion by some estimates. Why Are So Many Websites So Bad? It's been only a couple of years since the powers that be decreed that the Internet represented the future and every major company should have a Website, and by now, indeed, every major company has one. But, unfortunately, most corporate Websites are bad—unsightly (literally), difficult to work with, and missing vital content. The question is why.